This two-storey villa offers everything you could desire. Large bedrooms (all with TV and DVD-player) invite you to dream. The cosy living room allows for a comfortable time together. A game room offers entertainment during those days when you don't want to leave the villa to go explore. With a pool table, video game consoles and its very own bar it has all that you might need during your holiday! This house simply offers everything. The kitchen is fully equipped, not like in some holiday homes, where all utensils are counted based on the number of guests. The dining room offers enough space for the whole family. Thanks to its warm colours and stylish furnishings, it is cosy even if you are eating alone or as a couple. Many small, loving details all over the house create a feel-good atmosphere. The photos can only give you a little glimpse of what your holiday experience will be like. Phone: You can make phone calls free of charge to most European and US-American land lines. Virtual tour available: We would be happy to send you a link of our virtual tour. Cape Coral is located in the South Eastern part of Florida (near Fort Myers). Due to its many water ways and canals also known as the Venice of Florida, Cape Coral is one of the fastest growing cities of Florida. Its proximity to the Gulf of Mexico and Fort Myers, as well as to Fort Myers Beach makes it very attractive for those, who like to shop or sunbathe. Due to the central location, there are countless activities available to you: Whether you are into diving or golf, shopping or historical buildings, excursions or simply into relaxing and enjoying the peace, Cape Coral and surroundings offer almost anything. 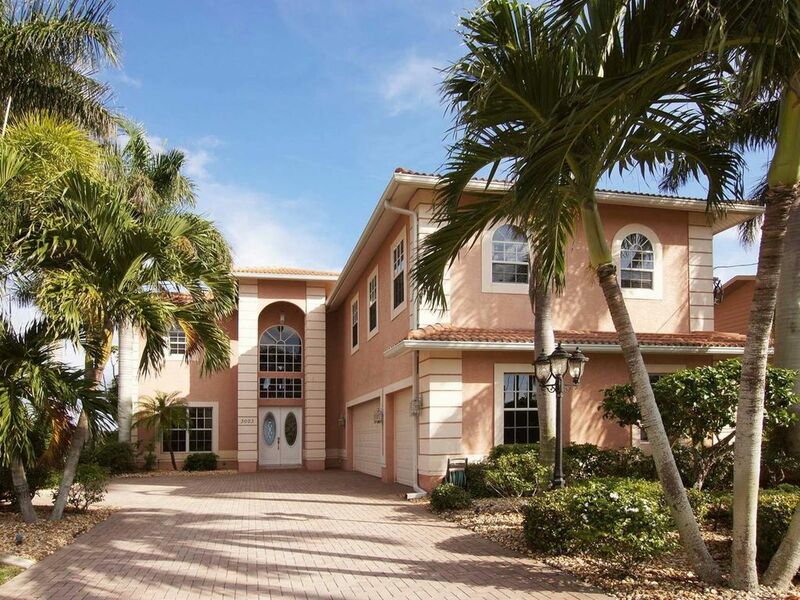 Villa Riverstar lies in the South Eastern quarter of the city and has a wonderful view of the Caloosahatchee River and offers the peace and tranquillity you desire during your hard-earned holiday, despite being very centrally located (5 minutes' drive to the next large shopping facility). But it's not only the interior that is special: The location directly at the Caloosahatchee River, only a small distance by boat from the Gulf of Mexico, make is absolutely unique. Begin your day with a gentle awakening to the sound of burbling waters, watch the light play on the waves and experience at every moment the pure joy of your holiday experience in Florida. This is the way holidays are supposed to be, and we think it should never end. Electricity will be settled with the security deposit of $500.00 which is required and the fee for the final cleaning is $250.00 (plus Tax). Fee for BBQ-Cleaning is $ 40 if required. This is a truly spectacular house. The owners seemed to think of every possible thing a renter might want and supply it. The property manager was lovely and incredibly helpful in answering questions. The house was spotless when we arrived. We shared the house with another family and each of us has a daughter. Each child had her own room and fhe two shared a bathroom. Each couple had a master bedroom and bathroom with a shared balcony and beautiful views of the water. The purpose of our trip was to watch our sons play college baseball during their Spring training trip, but the house is so lovely that we are thinking of returning next year for a non-baseball vacation. Truly a perfect house in a perfect spot. And the owner and property manager could not have been more helpful. Location in quiet neighborhood ideal, amenities outstanding, wonderful view, very well equipped. Had a great stay-owner and property manager were very helpful. So enjoyed our time at this property! Highly recommend! Beautiful home with the amenities! The property manager and owner were terrific and friendly. The home is beautifully furnished with all the amenities and a great location. We will definitely return. The house was beautiful and very clean ! The owners are very nice and easy to deal! We really loved our stay there ! From the moment we arrived we fell in love with this villa. The villa has everything you could want to make your stay enjoyable. The fridge had essentials, all the rooms were spacious and equipped to a very high standard. Outside the views are stunning and the pool is great. I am normally the one in the hot tub, but I have to say I really didn’t miss it! This place is definitely one we shall be returning to. This was our second time visiting Cape Coral and it will not be our last. After years of visiting Florida and using HomeAway, this is the first time we all have wanted to return to the same villa! Thank you Werner for sharing your beautiful home. Our villa is uniquely located directly next to the river. Cape Coral lies in the South-Eastern part of Florida (near Fort Myers). Due to its many water ways and canals also known as the Venice of Florida, Cape Coral is one of the fastest growing cities of Florida. Its proximity to the Gulf of Mexico and Fort Myers, as well as to Fort Myers Beach makes it very attractive for those who like to shop or sunbathe. Villa Riverstar lies in the south eastern quarter of the city and has a wonderful view of the Caloosahatchee River offering the peace and tranquillity you desireduring your hard-earned holiday, despite being very centrally located (5 minutes' drive to the next large shopping facility).